My husband’s birthday is coming up and he has quite the sweet tooth. I usually put aside the daily low sugar mantra for his birthday cake because he loves chocolate and sweetness and all those decadent things. I did stay on the gluten free track however, so we could all enjoy this and boy oh boy, did we enjoy it. This is a Peanut Butter and Banana Cake that is so densely rich and decadent that a little goes a long way. It’s slathered in Chocolate Cream Cheese icing and sprinkled with Butterscotch chips and the flavor combination is fit for a king. 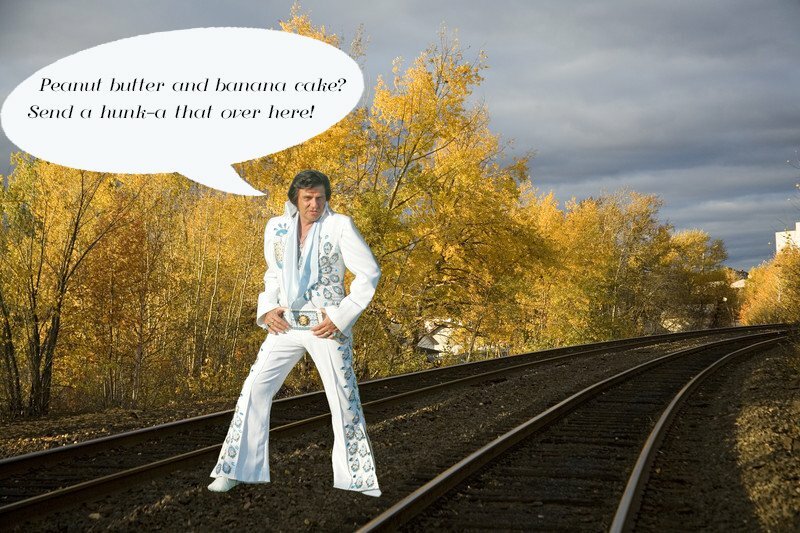 Naturally, I couldn’t help but think of Elvis while making this, it was no secret that he loved his peanut butter and banana sandwiches. Ha! I’m nuts. Ok, this is very much like a banana loaf, but the peanut butter takes it beyond mere banana loaf status. 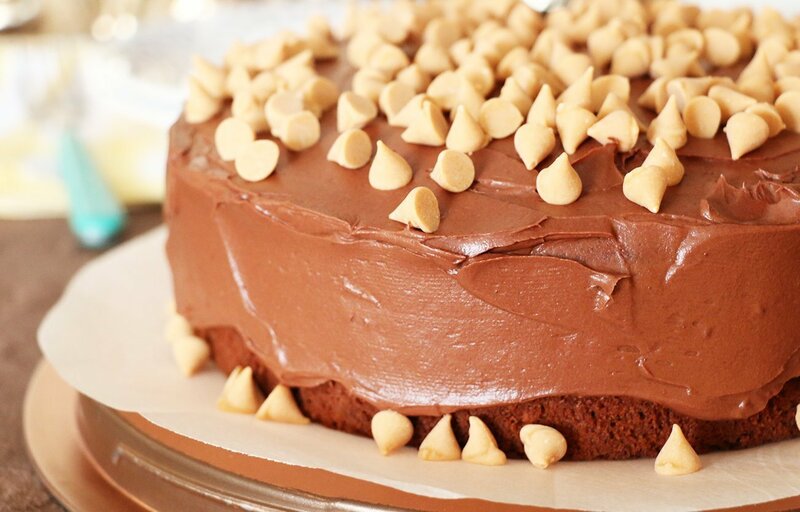 If you use chunky peanut butter, it also lends a really nice texture to the cake. This would be perfect however, as a loaf, with a smear of butter on top of a thick slice. Without the icing, it’s not super sinful as it’s sweetened with maple syrup and mashed banana. Oat and almond flours add some real nutrition and I could see this as a part of an easy breakfast. 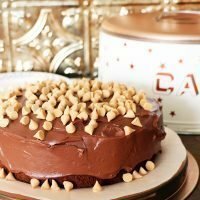 Adorned with chocolate cream cheese icing and sprinkled with butterscotch chips this cake is ideal for a birthday celebration – there’s no denying that. 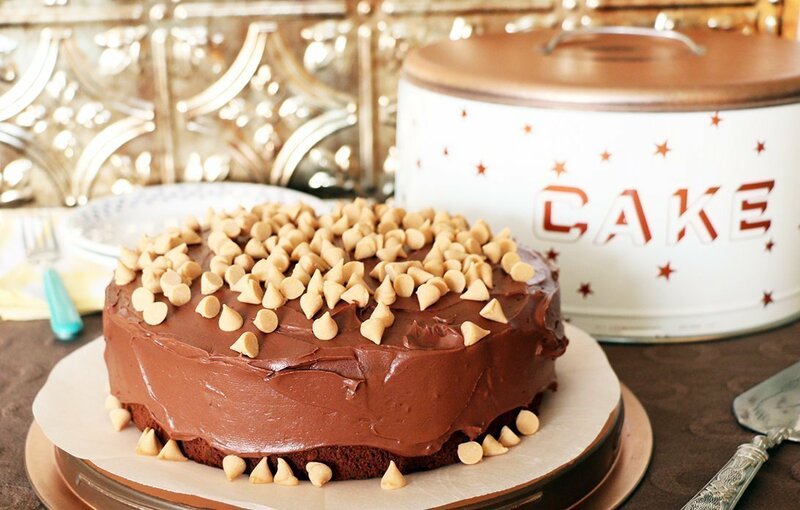 I’m not sure which I love more…the cake or the vintage cake tin I found at Sisters Roadside Treasures a few weeks ago? I’m so in love with that tin and I foresee using it as an excuse to make many more cakes. After all, a cake like this needs a snazzy home to hang out in for a few days. It will take us a while to dig our way through it. I baked this in an 8″ cake pan (3″ deep) and it came out high enough to slice into two layers. If you have two cake pans, divide the batter between them to lessen the baking time. Between the layers, I hid some more icing and another sprinkle of butterscotch chips. The icing is really nice too. 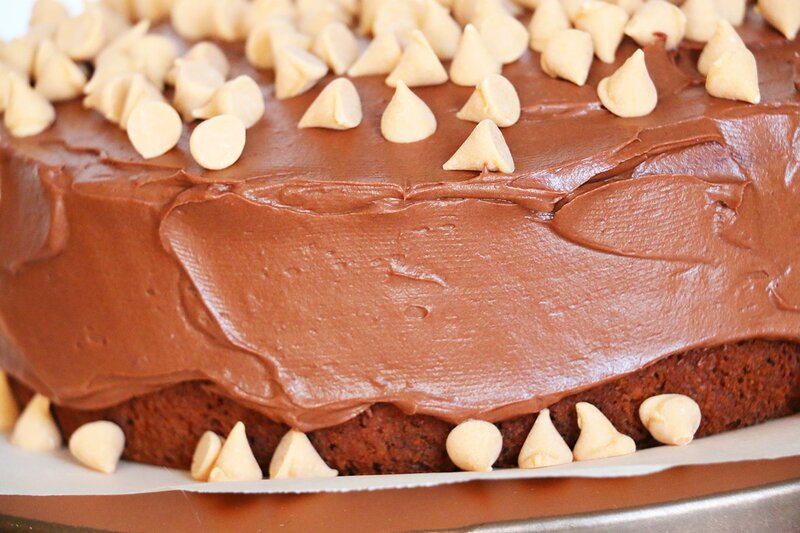 You could use your favorite chocolate butter cream but there’s just something about a cream cheese icing that puts an extra notch in the decadence column. Oh Mah Word. Okay, recipe time. A hunk a fantastic cake! Add all liquid cake ingredients to a stand mixer fitted with a paddle attachement (or use hand mixer) and blend on medium speed until well incorporated. Add all dry cake ingredients and mix on low until well mixed. Pour batter into prepared cake pans and bake until a skewer inserted in the center comes out clean. 60 min for one large cake like I made or 30 min for two 8" pans. When cooked, remove from oven and set aside for about 20 min. Then run knife around edge of pan and tip onto wire rack. Carefully remove parchment paper and allow to cool completely before icing. For icing, fit mixer with whisk attachment and mix butter, milk, vanilla, and cream cheese together on high speed. Lower speed and slowly add cocoa powder and icing sugar. Mix until well blended and then beat icing on high speed for a few minutes to ensure all lumps are out and icing is smooth. Ice your cooled cake and enjoy! You might want to pin this baby for later. If you make it, let me know what you think. I understand it’s not for everyone, some people really don’t like peanut butter and banana. I do though, and Rob was pleased with this cake – it hit all the sweet notes he loves. Looks ah-mazing Heather! I haven’t been able to get this cake out of my head ever since you mentioned it. YUM! OMG this looks SO GOOD. I hate baking, but I might have to dust off my mixing bowls for this one. This looks pretty good. The title made me laugh.